THESE BOOTS WERE MADE FOR STYLIN’. Nikki Luft owns ArtBoxx Salon &amp; Co. in downtown Eau Claire. 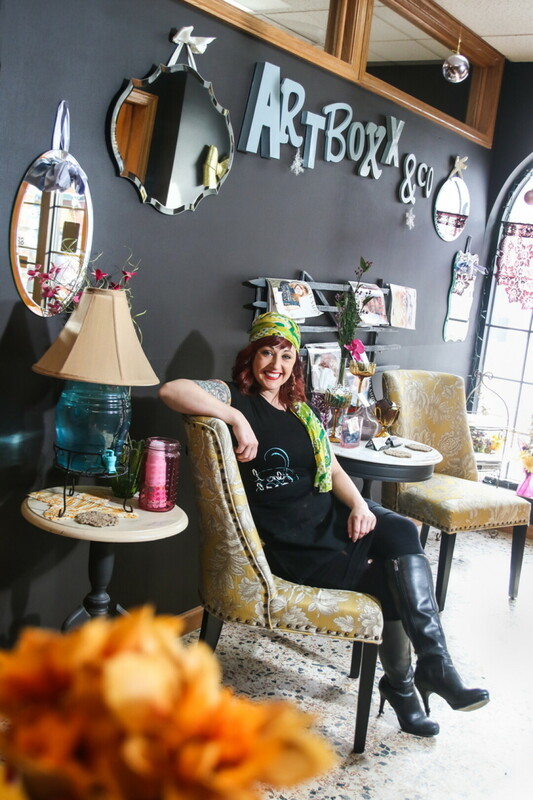 When Eau Claire native Nikki Luft opened ArtBoxx Salon & Co. downtown in June 2014, she introduced our city to a new style of business ownership. You see, ArtBoxx is more than your traditional hair salon. It’s home to an increasing number of independently owned businesses in the beauty industry. ArtBoxx, 419 S. Barstow St., is the first (and to date, only) salon in Eau Claire to use the salon suites model exclusively throughout the space, which means each stylist rents a room with a shampoo bowl and a locking door instead of renting a chair in someone’s salon. The suites model gives each stylist the freedom to personalize her “mini-salon” and to operate her small business however she sees fit. When a stylist is ready to branch out into small business territory, she or he must first acquire an establishment license, even to rent a chair. Even though they’ve paid for the right to run a business, the chair rental model often leaves stylists without full control of their operation, as the salon owner can dictate how the stylist should dress, what products she can carry, and even the hours she has to work. “If you have to have an establishment license,” said Nikki, “you should be able to have full control over your establishment.” With ArtBoxx, stylists do. “I love that the salon suites model lets me choose what product line to carry and gives me the freedom to run my business how I want, with fewer strings than at other salons,” said Mel Bushman of Melissa at ArtBoxx Salon, one of the original “BoXxStars” (ArtBoxx stylists). Other stylists cite benefits such as the freedom to go out of town for freelance work without asking for time off, having a mini-salon without having to run a salon with employees, and experiencing the diversity each stylist brings. ArtBoxx Salon & Co. initially opened with five suites, and now it’s expanding into the upstairs area of its space. Officially opening Feb. 1, the upstairs space features eight new suites (six of which were still available for rent at the time of this writing), an education area, a professional-style before-and-after photo shoot area, and some space whose use has yet to be determined. ArtBoxx currently has three educators in house, and the education area will host classes for and by the BoXxStars, as well as hair and makeup tutorials for the public. The space is also available to brand educators to conduct stylist classes as part of their continuing education. When the expansion is complete and the renovation dust has settled, ArtBoxx will have space to host up to 17 independently owned businesses, most of which will be owned and operated by women. For Nikki, ArtBoxx is more than a salon: It’s a network of women who collaborate as a community of artists supporting each other, as well as other small businesses, in downtown Eau Claire.